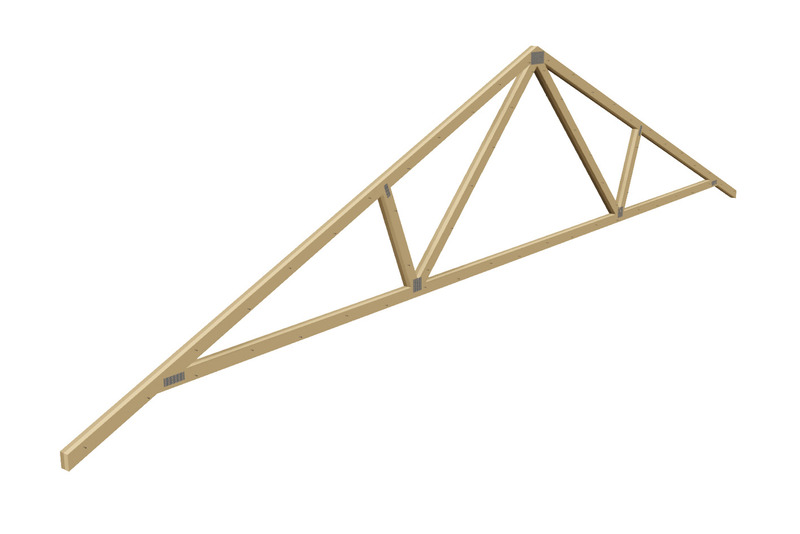 It is necessary that double trusses and triple trusses are nailed together prior to loading the roof. In Chords: two (2) rows (staggered) of 3.05mm diameter nails at maximum 450 centres from one side, or use 1/Green Tip screw. 1/Green Tip Screw at 600 centres. 65mm long for up to 38mm thick laminates. 75mm long for up to 50mm thick laminates. In Chords: Nail as for double truss from each side, and also use 1/M12 bolt at joints or 2/Green Tip EASY FIX™ Screws from each side at every web junction through the top chord, plus at the heel joint through the top chord. If bolted brackets are used on the bottom chord at 1200mm centres or less, then these bolts are sufficient for bottom chord. In Webs: Nail as for double truss from each side. 65mm long Green Tip Screws for up to 38mm thick laminates. 100mm long Black Tip Screws for up to 50mm thick laminates. Special truss design fixings may be specified in excess of this.